Free Shipping in Canada for Orders over $99. CODE: FREESHIP *Some exclusions Apply. *Please note that on game nights our store closes to the public at 4:30pm and reopens at 5:30pm to ticket holders. Can I pick up my order at the store? Yes, orders can be picked up at the Canucks Team Store located at Rogers Arena. Please note that we require photo identification and a copy of the order receipt at time of pickup. Please allow 2-3 business days for order processing (not including personalized items). We will notify you promptly once your order is ready for pickup. I'm looking for a specific item, but it's not available at your store. Am I able to place a special order for it? Unfortunately for most items we are required to order a minimum quantity so we are unable to place special orders for single items. If you are looking to place a bulk order or would like us to look at your special request on an individual basis please feel free to contact us. 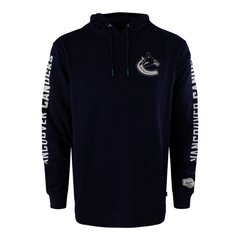 I'm looking for a specific item that I saw at the Canucks Team Store location, but I don't see it online and I'm not able to make it back to the Canucks Team Store. Is there anyway I can order it? 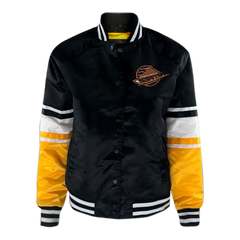 If you have recently seen an item at the Canucks Team Store location and would like to have it shipped to you please contact us If the item is still available we will be happy to look into it for you. Why isn't my discount code working? ﻿If you are trying to use a discount code but it is not applying to the order, please note the following collections that are excluded from ALL discounts. Final sale, no returns or exchanges. What countries do you currently ship to? Vanbase.ca is currently configured to ship to Canada, the United States of America, Australia, Belgium, Denmark, Germany, Greece, Hungary, Ireland, Japan, the Netherlands, New Zealand, Norway, Poland, Sweden and the United Kingdom, but we are able to ship to many more countries. If you are interested in making a purchase, but are not one of the countries we currently ship to please contact us and we will gladly look into it! My tracking says delivered, but I don't have my package? In the rare case that your tracking number shows that your package has been delivered, but you still have not received it, you must contact the shipping company (Canada Post or FedEx) to inquire as to the whereabouts of your package. Once a package's status is updated as "delivered", there is nothing we can do as the sender in terms of locating it. Vanbase is not liable for unforeseen issues caused by Canada Post/ FedEx or theft at your destination, but we will do whatever we can to help in the event of a lost of stolen package. Can I return an item purchased online? Please refer to our Return Policy for more details. You may also return / exchange an item by visiting us at the Canucks Team store. What types of payments are accepted? We accept MasterCard, Visa, American Express, PayPal, Apple Pay, and Shopify Pay. I would like to get a name and number put on to my jersey. How much and where can I get this done? Jersey customization can be done at the Canucks Team Store located at Rogers Arena. Please contact us for any questions or more information. How does the sizing work for the new adidas Authentic Pro jerseys? Have a question or comment? Let us know here! We appreciate your input to help improve our store. You can reach us by telephone at 1-604-899-7872 or contact us by email at info@vanbase.ca. Our customer service centre by email is open between 9am and 5pm from Monday to Friday. Please allow one business day for a response.